A deliciously sweet candy apple martini, the toffee apple is a fantastic cocktail for autumn. It features an impressive citrus vodka from Belvedere, mixing that with apple juice and a homemade toffee syrup. The cocktail's incredibly easy to make at home and will make an excellent addition to any party or occasion. 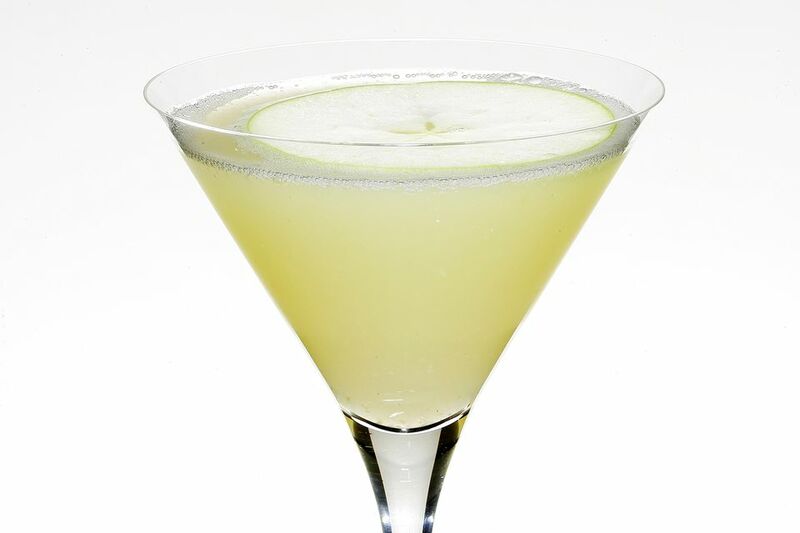 It's not difficult to find apple martini recipes that are sweetened with caramel. Most of them opt for a sweet liqueur such as butterscotch schnapps. While that's an easy option, using the toffee syrup adds a fresher twist and a truer flavor to the dipped apples that inspire these drinks. Don't worry, the syrup is extremely simple to make at home. We'll tell you how it's done and give you a few alternatives as well. Though any apple juice will work, the toffee apple is best with freshly pressed apple juice. Cider works as well, so head out to the apple orchard and pick up the good stuff. In a cocktail shaker, combine all of the ingredients with ice. Tip: To keep your apple garnish looking great and prevent it from turning brown, give it a quick dunk in lemon juice right after you cut it. The toffee syrup used in this cocktail is very easy to make at home. This recipe relies on toffee candy (without nuts or any other additives) and simply dissolves it into hot water. It should take only 15 or 20 minutes to prepare and can be stored for a couple weeks in the refrigerator. This recipe will make just over 1 cup of syrup and give you plenty for multiple rounds of drinks. You can increase it if you like and the syrup can be used to flavor other drinks. It's a delicious addition to your morning coffee. In a saucepan, combine about 3/4 cup of toffee candies and 1 cup of warm water. Apply a gentle heat and stir constantly until the toffee is dissolved. Allow the syrup to cool before pouring into a jar with a tight seal. If solid bits of toffee remain, strain them out using a fine mesh strainer or cheesecloth before bottling. All toffee candy is different, and store-bought toffee may be sweeter than your homemade toffee, or vice versa. While the toffee typically makes the syrup sweet enough, you can add about 1/2 cup sugar if you like. Taste the syrup after the toffee dissolves and add sugar if you think it's needed. Stir the syrup after adding sugar, bring it to a slow boil, and simmer for about 5 minutes before testing it again. Keep in mind that the longer a syrup is on heat, the thicker it will become. It probably won't thicken until it cools, so it can sneak up on you. Go slow and gentle on the heat. That recipe is a very basic method for making a syrup with a sweet caramel flavor. It is not your only option, though. If you want to make the toffee apple cocktail and don't want a DIY project, many brands of syrup offer a caramel flavor. Torani and Amoretti are two good choices and they're readily available at grocers. Another option is to make a caramel sauce. This tends to be thicker than a syrup, but you can always stir in a little water to make it thinner and easier to mix into cocktails. You can also use the thinning trick to make caramel or butterscotch toppings that you'd use for ice cream work. Just be sure to add water in small amounts (a tablespoon at a time) and stir it thoroughly before deciding if it's the right consistency. Of course, if you're in a pinch and just happen to have butterscotch schnapps in the bar, it will make a fine substitute for the toffee syrup. How Strong Is the Toffee Apple? Since the citrus vodka is the only liquor in this cocktail, it's significantly lighter than most apple martinis. If you stick with Belvedere—which is 80-proof rather than the 70-proof typical of flavored vodkas—the drink weighs in around 12 percent ABV (24 proof). That's about the same as a glass of wine.